Kornelijus is an investment director in Baltcap - a Baltic Private Equity and Venture capital fund which oversees 20 million Euros in Lithuania SME Fund. Previously Kornelijus was a partner at MTVP, a VC fund focused on Russia and the Baltics. Kornelijus has also worked at Deutsche Bank’s Investment Banking Division in London and regional M&A advisory firm Prime Investment in Lithuania. 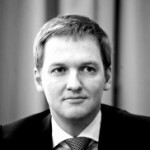 Kornelijus is currently a board member in Ygle and Impuls. Recent Baltcap investments include Yplan.